Jacob Pallet CR reports here on the “First Professed” conference held at CSMV and his affection for the Community at Wantage. My third First Professed Conference and our second conference at Wantage, the home of The Community of St Mary the Virgin (CSMV). I helped to organise the event with Br Christopher Martin SSF, who thankfully did most of the work! Our theme was ‘Inspiring the Future’, not the most orginal of titles for which I apologise, as the theme says more about me than about Jesus! CSMV was one of the earliest to be founded during the Oxford Movement, although like most of our Anglican Communities very many still do not know of them! CSMV has a long and venerable life and was the first Community I encountered before my terrible-teens. Sister Anna (now at her heavenly rest) was the first sister I met. I glimpsed in Sr Anna and her fellow Sisters (still alive today!) something of the joy and delight of following Jesus, in a Community under the patronage of His Blessed Mother. This had, and still has, a tremendous impact on my life. The call of Christ has been the same thoughout the ages: “Come, follow me”. The Sisters CSMV like our other Sisters and Brothers in Christ made a response: the offering of their life to Christ in the Religious Life. I do not always find it easy to be the youngest, and I cringe when I’m told “you are the future” – what a dreadful thought! But I know that we ‘young ones’ can find solace and inspiration from those who are with us now; those who have lived this life faithfully for many years, who have said their prayers and followed Christ. They are the ones with a wisdom for a life of total surrender to the call of Christ. They would never take me seriously if I were to tell them that they are an inspiration! 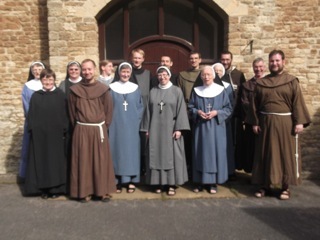 Sr Stella CSMV led us on our retreat day together, rising to the occasion with not the easiest of themes! giving her reflections and pointing us towards Christ. Wednesday gave us the opportunity to meet with Sr Edmée SLG, whose life study has been the Song of Songs. Her book ‘The Song of Songs and the Eros of God’ is a very fine piece of monastic scholarship. Sr Edmée’s study is one grounded in prayer, and is at home with the language of the Jewish and Christian Mystics, so rarely heard in the church any more. Sr Edmée opened to us the scriptures; turning us, heart and mind, towards our first Love. Thursday was a good day too. We ‘young ones’ are well aware that we live with the ‘young at heart’, who cared for the elders of their generation, and who now need our care. To this end we are the ones who offer the final care to those whose time with us can seem too short. Dr Elizabeth Lowson, a palliative sociologist, talked with us about caring for the elderly, the reverence of life to the end and the making of a holy death. Later in the day, Dr Sara Batts spoke with us about the use of websites and social media, and how best we can communicate the Religious Life, and offer the fruits of this life to the world.